The One Hand Tool (OHT) from Leatherman solves the problem of having to choose between blades or pliers, as the OHT has both! The name doesn't lie, and you can access all the tools inside by using one hand. 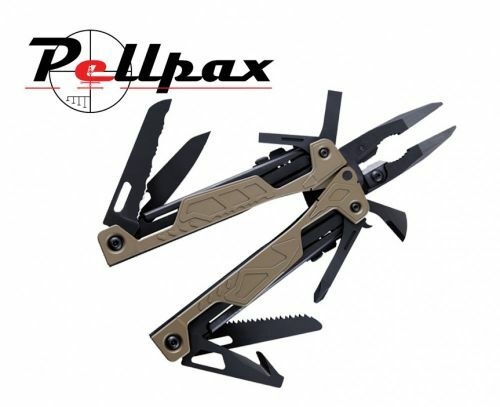 It features spring action needle nose pliers, an oxygen tank wrench, a strap cutter, a can opener, a bottle opener, a saw, small, medium and large screwdrivers, a Philips screwdriver, and spring action regular pliers. Also, it has a 420HC knife, a #8-32 cleaning rod attachment, a 420HC serrated knife, spring action 154CM wire cutters, and 154CM spring action hard-wire cutters, Both of these wire cutters are replaceable as well. If for any reason you're unsatisfied with this product, it comes with a 25 year warranty as well, and comes with a brown MOLLE sheath.